El-Maasara village, in the north west of Dakahlia governorate, celebrated long into the night following the wedding ceremony of a 12-year-old boy and his ten-year-old bride this weekend. The marriage of Fares al-Saaed, a preparatory school student, to Nancy, still at primary school, was held in the middle of a village street. Dubbed by villagers the "youngest bride and groom in the world,” the couple were fêted lavishly with performances from a music band and three belly dancers on a large stage. The families of the two minors signed unofficial papers as a record of the marriage, which will remain unrecognized by the law, Rabea Ahmed, a villager, told Al-Masry Al-Youm. Guests at the mock wedding said the bride wore pink instead of the traditional white dress to avoid complaints to authorities about the ceremony. According to local Adel al-Saaed, weddings of this kind are common in the village, but it is unprecedented at quite so young an age. 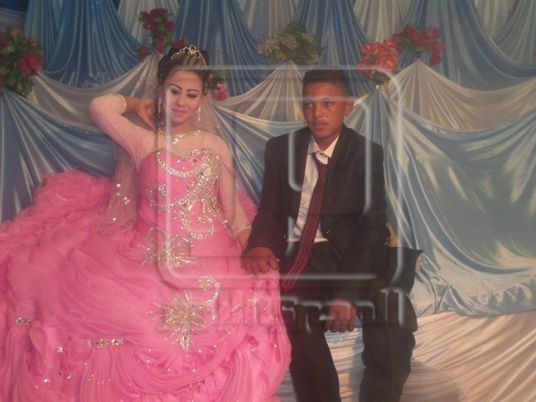 Mahmoud Shabana, a lawyer from the governorate, told Al-Masry Al-Youm that this wedding is illegal, and any infants born of the marriage cannot be recognized officially. Despite the fact that the phenomenon is so common in the region, authorities have so far not made efforts to stop it, said Shabana. Nobody is held accountable, so people continue the illegal practice. Families dodge accusations by claiming ceremonies are for engagements rather than marriage, he said. The minimum age for marriage by Egyptian law is 18, but based on UNICEF figures for 2016, 17 percent of Egyptian girls are married before then. A 2008 amendment to the Child Law meant that child marriages are now prohibited, but not criminalized, said the global campaign Girls Not Brides. Nevertheless, in recognition of the negative impact of child marriage on health, education of girls and population growth, the government began to develop a national strategy in 2013 to reduce the phenomenon by 50 percent in five years.